How to Succeed as a Solar EPC in India? Use Solar Mango’s India Solar EPC Blueprint to understand everything about this fast-growing opportunity. Wish to become a successful Solar EPC in India? With solar power growing at a fast pace in India and with the central state governments providing significant thrust and incentives for its growth, many entrepreneurs and businesses are keen to become an EPC. This is a detailed blueprint document for them. This comprehensive expert report and guide will be invaluable for those keen on entering the solar EPC business in India. Solar Mango’s India Solar EPC Blueprint, in addition to providing detailed inputs on the business and revenue models, key market segments, key sales strategies and more, also includes important sections on risks and risk mitigation for solar EPC where it clearly spells out the areas of uncertainties, and how adverse effects of each uncertainty can be mitigated. Why is it critical to purchase this report? Due to the low investments required, reasonable profit margins and availability of skilled solar professionals, Solar EPCs are currently an attractive business opportunity in India. This actionable guide by Solar Mango provides critical data, insights and resources that enable businesses to take their optimal first steps in becoming Solar EPCs. This report is unique due to the following reasons. Why buy this report from Solar Mango? 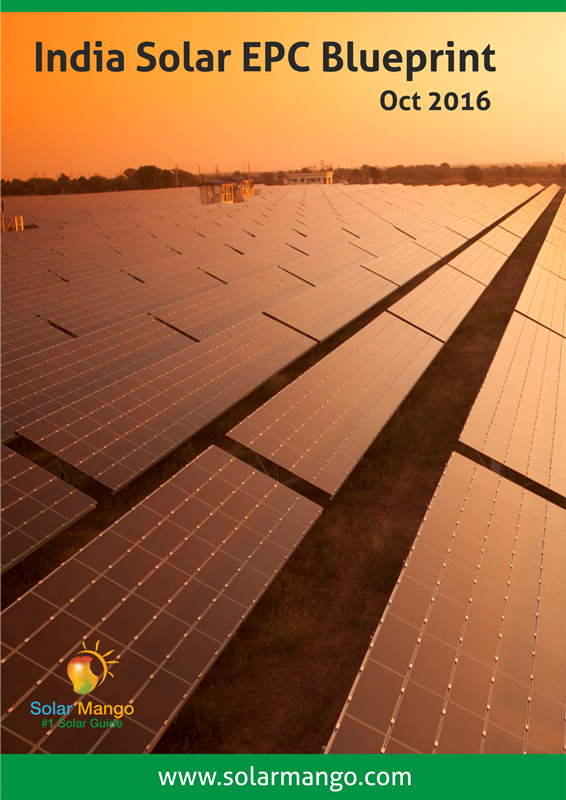 Solar Mango is a leader in the solar energy research, consulting and education domains for the Indian market. This India Solar EPC Blueprint is written by industry experts from Solar Mango with experience in business, technical, operational and financial aspects of the Indian solar energy sector. Our team works with over 30 EPCs from across the country, some of them top tier, and assists them in growing their business. Project Completion Risks – Most aspects of a solar PV power plant project are well defined and hence there should not be too many delays. However, this section provides inputs on delays that could yet happen owing to approvals, possible issues with grid extension to the substation, etc. Policy and Regulatory Risks – This section provides detailed inputs on specific risks that could happen, owing to policy, legal and political constraints, some of which are specific to solar PV power plants. Technology Risks – While most components of the solar PV power plants have achieved technological maturity, for an investor it is critical to know the exceptions when there could be technology failures. This section provides inputs on possible instances of panel or inverter failure, and also possible failures that can occur in other portions of the solar power plant. The section also provides exclusive details on systems that can be installed to both prevent such failures and minimize the damages in the instance of failure. Operational and Performance Risks – The key uncertainty for a solar power plant performance is the amount of sunlight available; other than this, performance can be significantly affected due to poor monitoring and maintenance. This section provides detailed inputs on the possible results of underperformance owing to poor maintenance. How long do sales cycles take and how to shorten them? What are the key roles expected by solar EPCs? Details will also be provided for what portion of land is required for what purpose. Data on relevant environmental aspects such air pollution. Suggestions and recommendations to significantly increase the output from your solar power plant. These are based on real life inputs collected by the Solar Mango team from across India. Comprehensive financial analyses are provided for a number of scenarios. This section will critically aid you and your team to fully evaluate the financial feasibility of investing in a solar power plant. Details of latest solar policies in India, both central government policies and policies for various states.